We’re proud to partner with Shaw Sports Turf fields on this donation from Pilot Flying J and the Haslam Family Foundation, working together to help support high schools across Knoxville. 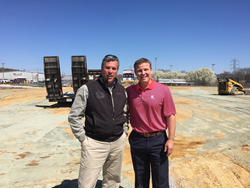 Work is now well underway on the largest high school synthetic turf project ever in the state of Tennessee. The project, funded by the Haslam Family Foundation and Pilot Flying J, will involve the installation of Shaw Sports Turf playing surfaces at 13 Knoxville high schools over the next three years. Work has already begun at two of the schools, including Powell, and Fulton. Work was expected to begin yesterday at Farragut High School and Bearden High School. Local sportscaster Mark Packer typically broadcasts 16 games per year in the area and said that he would go to all the area schools that had nice fields and then go to the Knox County Schools, where games would have to be cancelled or rescheduled and the fields didn’t have any grass or were full of holes, patches, or rough spots. Packer came up with the idea of installing synthetic turf at the schools and immediately found a willing donor in the Haslam family. For the project, Baseline Sports Construction of Knoxville was selected and Shaw Sports Turf was selected for the fields. Baseline is a full service recreational contracting company that has served the Southeast since 1982. Synthetic turf fields provide many benefits including reduced maintenance, the ability to have more programmable hours of activity, the possibility for increased revenue as a result of having more events, consistent performance, and a source of pride for the community. The schools receiving fields in the first year are Powell, Fulton, Bearden, Farragut, and Central. In year two, the recipients will be Karns, Gibbs, Halls, and Carter. In year three, West, Austin East, Hardin Valley, and South Doyle will install fields. Shaw Sports Turf, which has over 2,000 synthetic turf field installations in the United States is also a proud partner in the project. “This project truly is about community,” said Jimmy Marshall, Territory Manager with Shaw Sports Turf. “These athletic programs will benefit for years to come and the academic programs at each school will be strengthened by the generosity of the Haslam family. Work on the first five fields is expected to be completed by the end of summer. Fulton will host Maryville in the Pilot Battle of Champions, which will be played on Saturday, August 27. The game will be broadcast live on WVLT (CBS) and online at http://www.rivalrythursday.com. Pilot Flying J, the largest operator of travel centers in North America, is committed to making life better for professional drivers. Headquartered in Knoxville, Tennessee, Pilot Flying J has more than 650 retail locations, 52 Goodyear Commercial Tire and Service Centers (Wingfoot) and 44 Boss Shops, all of which accept MyRewards cards for Pilot Flying J’s loyalty program. The Pilot Flying J network provides drivers with access to more than 70,000 parking spaces for trucks, 4,800 showers and more than 4,400 diesel lanes offering Diesel Exhaust Fluid (DEF) at the pump. Pilot Flying J is currently ranked No. 8 on Forbes' list of America's Largest Private Companies. Visit http://www.pilotflyingj.com for more information.